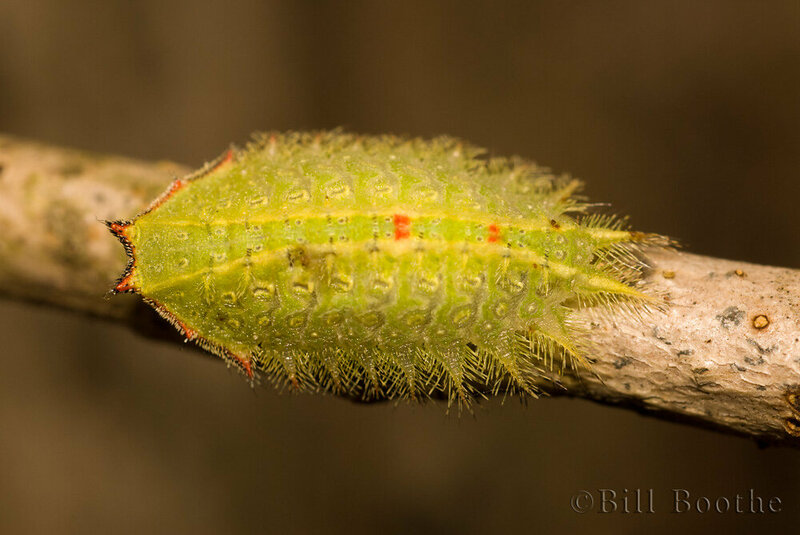 The bright red prolegs are a quick giveaway that this is a Spotted Apatelodes moth caterpillar. The color of the Spotted Apatelodes Moth caterpillar can range from white to bright yellow. Note the bright red prolegs. This is a beautiful caterpillar, but those who have experienced the stinging hairs of this caterpillar will tell you to avoid touching it. The more common form of this caterpillar resembles the brown or gray color of tree bark rather than this beautiful green color of lichens. Although called a worm, it really is the caterpillar stage of the Catalpa Sphinx Moth. The adult moth is known as the Regal Moth or Royal Walnut Moth. This caterpillar is also known as the Poplar Tentmaker. Note the scalloped stripe which can range in color from orange to yellow. This particular caterpillar was feeding on Eastern Silver Aster (Symphyotrichum concolor), another member of the Aster family related to Camphorweed (Heterotheca subaxillaris). A pest of azaleas, these caterpillars become moths known as Major Datana. The Pitcherplant Moth caterpillar is found inside pitcherplants. This one is in the flower of the yellow pitcherplant (Sarracenia flava). This caterpillar perfectly matches a branchlet of a tree. Which end is which? Its head is at the bottom. This sphinx moth caterpillar was one of several that was feeding on Walter's Vibrunum (Viburnum obovatum). This caterpillar was crawling on the bark of a hackberry tree.